We came across this impressive arachnid whilst tidying the garden recently, which a little research identified as a Nursery Web Spider. 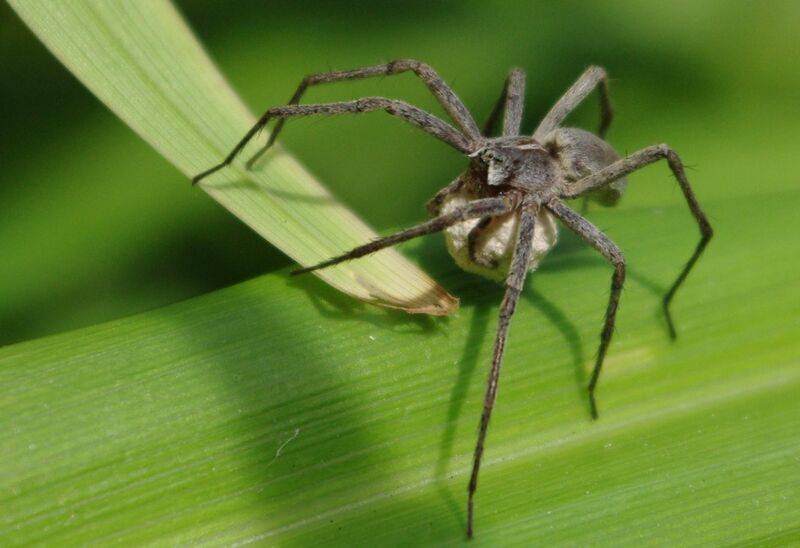 The British Arachnological Society gives the following summary description, which reminds me that I often see it’s silken funnels amongst the long grasses in the set aside land around our village. Seeing it with egg sac adds another dimension to its life cycle. The distinctive silken tents of this spider can be found in great profusion on grassy banks and road verges. The Nursery Web Spider grows to 15mm and has long powerful legs. Having good vision, they are active hunters searching for prey amongst grasses and low vegetation. When resting or detecting prey, they extend their first and second pairs of legs straight out together at an angle. A female carries her large eggs sac beneath her body, held in the jaws. Prior to the spiderlings hatching she fixes it to some plants and spins a silken tent around it and then stands guard. It is the distinctive tents that give her away. She guards the eggs and spiderlings, giving rise to the English name of Nursery Web Spider. Nursery Web Spider, Pisaura mirabilis, The British Arachnological Society. Bookmark.